The 655K’s net power has increased from 145 hp (108 kW) to 155 hp (115 kW), while the 755K’s net power has increased to 194 hp (145 kW) from its previous 190 hp (141 kW). Continuing to build on the strengths of the K-Series lineup, John Deere announced the introduction of the 655K and 755K Final Tier IV crawler loaders. These machines serve as the latest additions to the crawler loader line and provide operators with increased productivity and uptime, along with lower daily operating costs. Designed and manufactured in Dubuque, Iowa, the 655K and 755K feature familiar designs, systems and components consistent with other product lines throughout the John Deere crawler family. 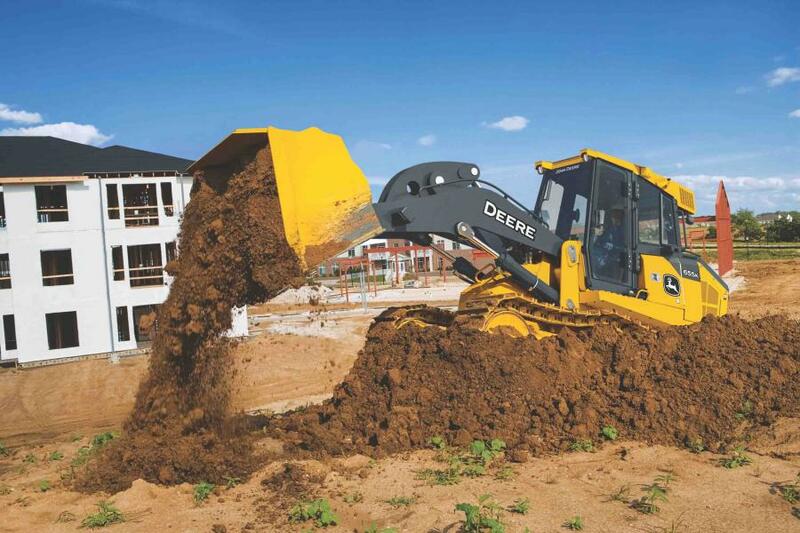 "Keeping customers top-of-mind, our goal is to provide fleet managers and operators with equipment capable of maximizing efficiency on all fronts," said Nathan Horstman, product marketing manager, crawler loaders, John Deere Construction & Forestry. "The 655K and 755K exemplify our commitment to producing equipment featuring industry-leading technology engineered to minimize downtime and grant users an innovative, reliable crawler loader solution." Featuring a certified Final Tier IV John Deere PVS 6.8-liter engine, the 655K and 755K use proven technology and a building-block approach based on a solid foundation of reliable John Deere engines. Additionally, both machines exhibit a rise in overall horsepower. The 655K's net power has increased from 145 hp (108 kW) to 155 hp (115 kW), while the 755K's net power has increased to 194 hp (145 kW) from its previous 190 hp (141 kW). The 655K and 755K boast hydrostatic transmissions, a feature John Deere pioneered in crawlers in North America in 1976. These transmissions provide customers with infinite speed control, power management, live power turns, counter rotation while staying in gear and dynamic braking. In addition, Total Machine Control allows customized machine response that can be tailored to meet the needs of individual operators. Hydrostatic transmission control options give operators the ability to choose between multiple transmission control settings — speed-in-grip and a v-pattern control with foot pedal steering. Inside the cab, on-board hydrostatic and hydraulic pressure sensors make it quick and easy to read pressures in both the hydrostatic and hydraulic systems without the need for external gauges. By simply using the monitor, a technician can quickly gain access to important system pressure data. Both the 655K and 755K are equipped with Eco Mode, yielding up to 20 percent less fuel consumption with no loss in productivity. When enabled, Eco Mode optimizes fuel economy while maintaining ground speed by automatically adjusting engine speed and transmission settings based on the load. When a heavy load is encountered, engine speed increases rapidly to ensure power is available to push through the load. Eco Mode works in both forward and reverse directions to improve overall fuel economy and productivity. A new standard reverse camera provides operators with more visibility on the job site. The large color camera display provides the operator with visibility to the ripper and rear of the machine, while still focusing on the task at hand. Additional crawler features include increased reliability through optimized hose and harness routings, the Quad-Cool cooling system, keyless start and coded-security modes. 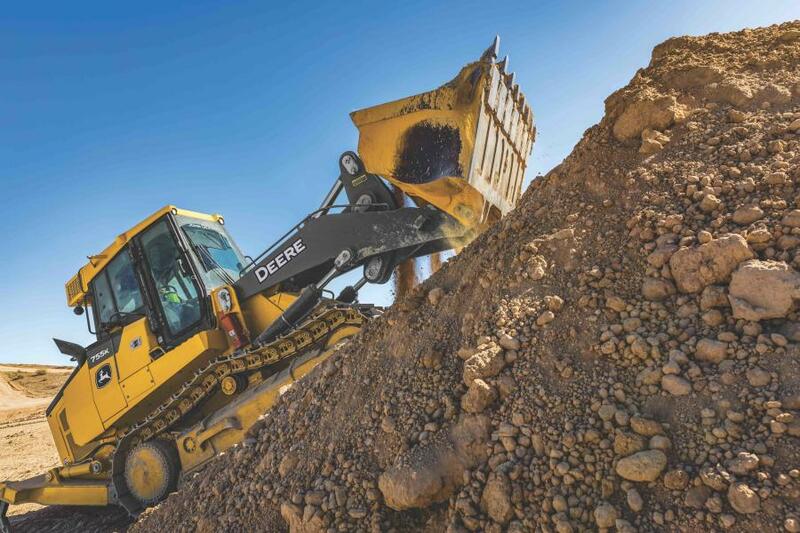 Fleet managers looking to get the most out of their 655K and 755K crawler loaders can rely on their John Deere dealers to provide Ultimate Uptime, featuring John Deere WorkSight. With Ultimate Uptime, owners receive predelivery and follow-up inspections that include five years of JDLink telematics, machine health prognostics, remote diagnostics, programming capabilities and the ability to add dealer-provided uptime solutions to a customized package.